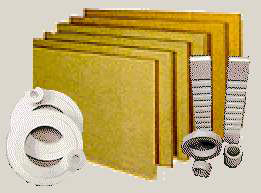 Insulwrap mineral products are non asbestos materials comprised of mineral, glass or ceramic fibers typically bonded with thermosetting resins for insulation against elevated temperatures. Most varieties of Insulwrap mineral products offer significant Acoustical advantages as well making them suited for noise control solutions where lower temperature products are not practical. Product selection should be determined by individual application conditions. Please contact our sales staff for further information and assistance.